After watching "The Mask of Zorro" (and I watched it 4 times at the theatre in 3 weeks!) I really became interested in the man who played Don Diego de la Vega, Sir Anthony Hopkins, a famous and talented Welsh actor, who starred in f.e. "Silence of the Lambs" (Oscar! ), "Howards End", "Bram Stoker's Dracula", "Remains of the Day" and now in "The Mask of Zorro". 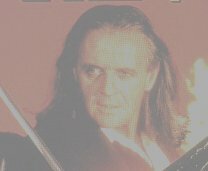 I started with a Swordfight Page which contains Zorro-pics (also "The Man in the Iron Mask starring Gabriel Byrne and "Robin Hood, Prince of Thieves" starring Alan Rickman) The Swordfight Page is updated 21-11-1999 with DVD pics of the movies, mentioned before!